The Restaurant – Arrocería «Oasis», situated in a second open floor, is located in the southern part of the camping. Beachfront, beautiful views of the sea and the town of L’Escala and Roses. 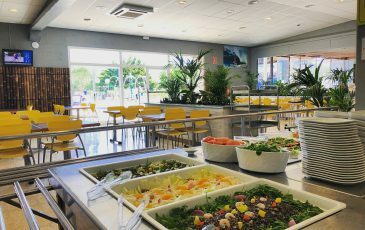 This restaurant is committed to a cuisine based on rice, combined with seafood and vegetables from l’Empordà: Rice with lobster, rice with vegetables, sea ​​and mountain rice, risotto, fish dishes and local seafood or salads, are some proposals for their menu. 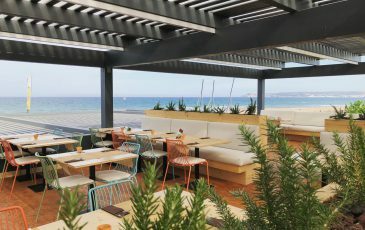 The trattoria-pizzeria «El Xiringuito» is an outdoor restaurant located in the northern part of the camping from which you’ll enjoy magnificent sunsets. 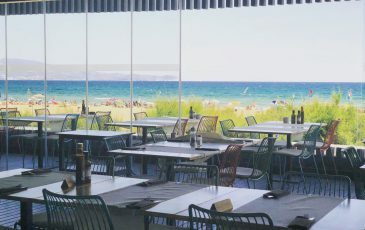 This restaurant offers a menu of fresh pasta with various sauces to choose and unique pizzas with a Mediterranean flair. Desserts, as the pancakes made at the momet or ‘pannacota’ homestyle, is the top on a thematic night in true Italian style.